The Civil Future Security Lab informatively and innovatively showcases recent work at the Einstein Center Digital Future on Research for Civil Security. 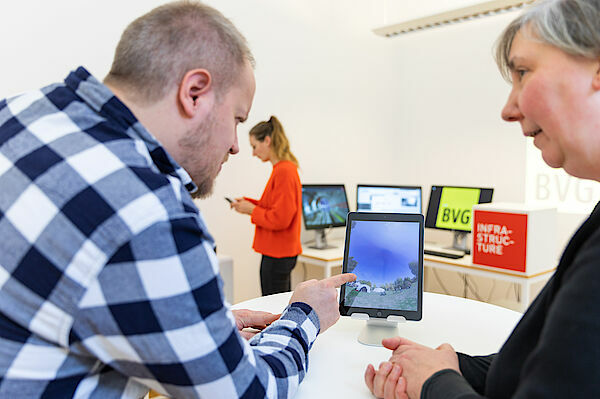 Interactive scenarios invite people to engage with and discuss the wide variety of issues involved, ranging from organized crime in Germany and the opportunities and challenges of digitalization to extreme weather events. A project funded by the German Federal Ministry of Education and Research, the “Futures Lab of the Research Forum on Civil Security” at Freie Universität Berlin provides experts with a platform for information, discussion and hands-on experimentation. The research is brought to life with informative presentations and exhibits that offer an immersive experience of realistic situations. The Future Security Lab demonstration room is at the Einstein Center Digital Future, in the Robert Koch Forum in Wilhelmstrasse, Berlin. Its central location makes it easy to get to for researchers, policymakers and the public. At the Einstein Center Digital Future, various professorships conduct research into various aspects of digitalization. “The Future Security Lab also provides the Einstein Center professorships with a great opportunity to present their research outcomes and invite discussion around them,” said Prof. Dr.-Ing. Jochen Schiller, professor of computer science at FU Berlin and board member of the Einstein Center Digital Future. The scenario on organized crime starts with the observer listening in on a secret meeting of a mafia organization. Recent research outcomes are presented in line with the relevant focus areas: Research on counterfeit drugs (project name: MIME), document falsification (SecureStamp) and drug trafficking on the dark web (DROK) is presented using videos and demonstrators. In the background, a money laundering clock runs in real time, displaying how much money from illegal dealings is laundered in Germany every second. Research and development are often technology-driven and appear to neglect social effects. The Future Security Lab therefore also questions research itself and provides space for critical debate. What dangers does society face? How are they to be addressed? In what ways does society change as a result of security technologies? The Future Security Lab is directed at experts from the field of security research, decision makers in the field of disaster and civil protection, and policymakers.